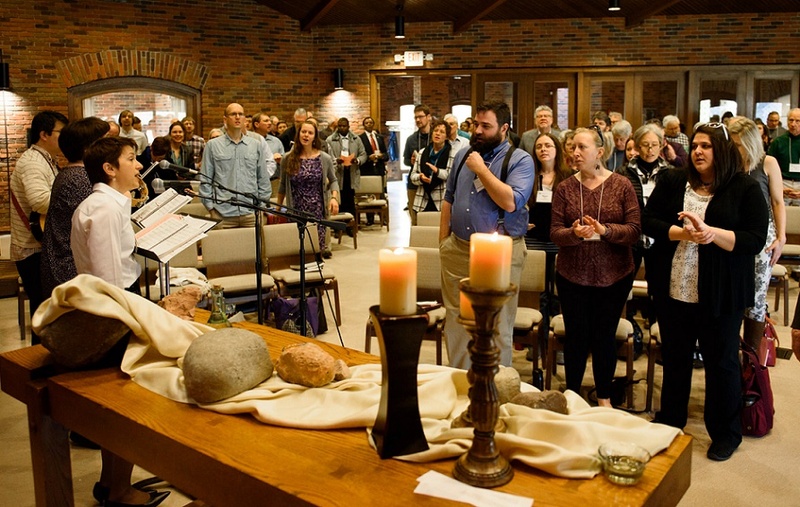 More than 160 registrants from 14 U.S. states and two Canadian provinces—representing 11 denominations—sought renewal through plenary teaching sessions, workshops and worship, as well as fellowship. Each of the four plenary speakers provided words of encouragement to help participants sustain their faith while facing adversity. “In moments of beholding, we forget our agenda . . . pulled toward awe and wonder and delight in the resplendence of God,” Schrock said, but he cautioned that prayers of beholding don’t resolve or eliminate the issues causing stress. Rebecca Slough, AMBS academic dean, shared about several “roots” that nourish her mind and spirit, such as trust, discernment, hope and the invitation to confront truth, and led the group in singing a hymn connected with each one. She encouraged her listeners to consider which practices nourish them. She encouraged those present to learn from people on society’s margins to have hope in the Lord. “They know how to hang on, especially to the hope for justice, that many of us have never needed to develop,” she said. Christians need to challenge the conventional and take risks, she said, just like Jesus Christ, Anabaptist martyr Dirk Willems and religious leaders Martin Luther King, Jr. and Desmond Tutu did. Slough also called for more celebrations of the Lord’s Supper, calling it a ceremony of hope. “[Jesus Christ] is our hope until the kingdom comes,” she said.